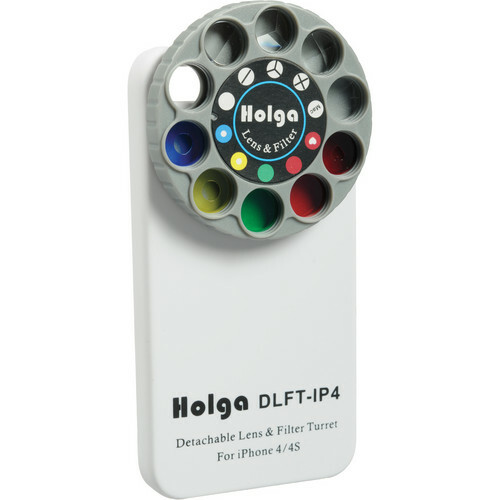 Holga's Lens Filter and Case Kit for iPhone 4/4S provides a white case and filter wheel to allow you to shoot creative images and video with your iPhone 4/4S. Simply slip your phone into the case, and turn the wheel to any of the nine lo-fi effects. Although the kit obscures the flash on the iPhone, you'll have full access to all buttons while your phone is inside the case. The kit features a retro design reminiscent of vintage telephones for added fun. Choose from special effects like a dual or quadruple image lens, 60mm macro lens, colored filters and more. Plus, there's also an empty hole in case you want to take a raw image without removing the case or filter. Box Dimensions (LxWxH) 6.8 x 4.2 x 0.8"
Lens Filter and Case Kit for iPhone 4/4S (White) is rated 4.3 out of 5 by 3. Rated 4 out of 5 by Rebecca from Fun and Unique I got this for my 12 year old son for Christmas. He loves photography but isn't yet responsible enough for expensive equipment. He also loves uploading photos to Instagram and FaceBook. He loved this gift! It's solid for the money, and he gets to experiment with photographic effects. I played with it myself and had fun, although not all the filters are that great. The filter comes off easily so it can be used as a normal phone case as well. Fun and unique! Great gift for teens to get them interested in photography beyond silly selfies. Rated 5 out of 5 by Mo from Fun gadget! Just a simple, inexpensive tool to add interest to cell phone photography! The phone case separates from the filter wheel, and easily reattaches using magnets. Nicely made. Rated 4 out of 5 by gift buying dad from Great gift Got it as a gift for my daughter. It is great that the lens comes off so the case can just be used as a phone case. Also, easy to reattach because it is only held on by a strong magnet. The quality of the lenses is commensurate with the price if not a little better.